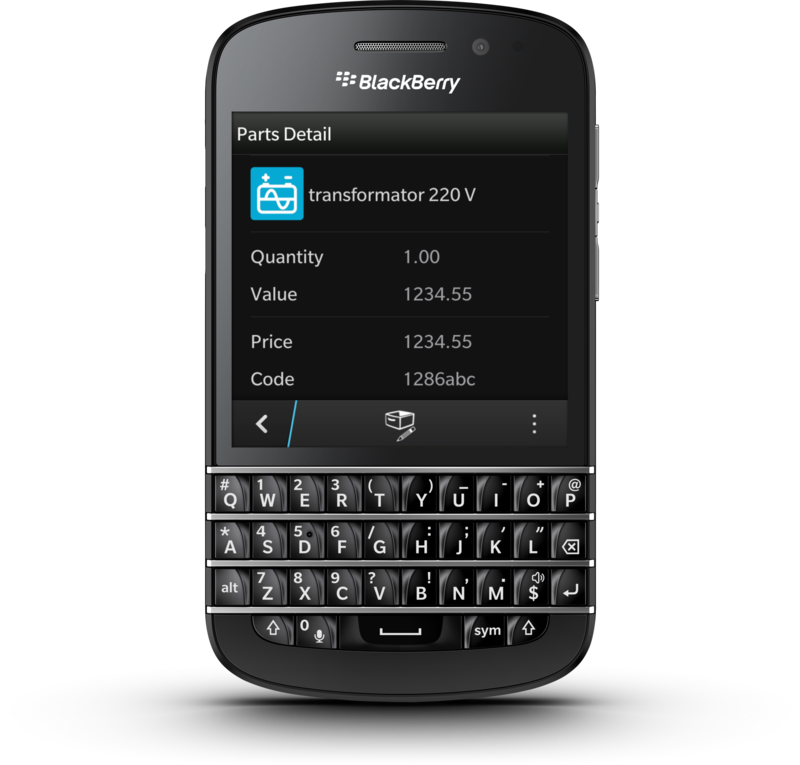 Cascades gives you the power to navigate easy through your apps. 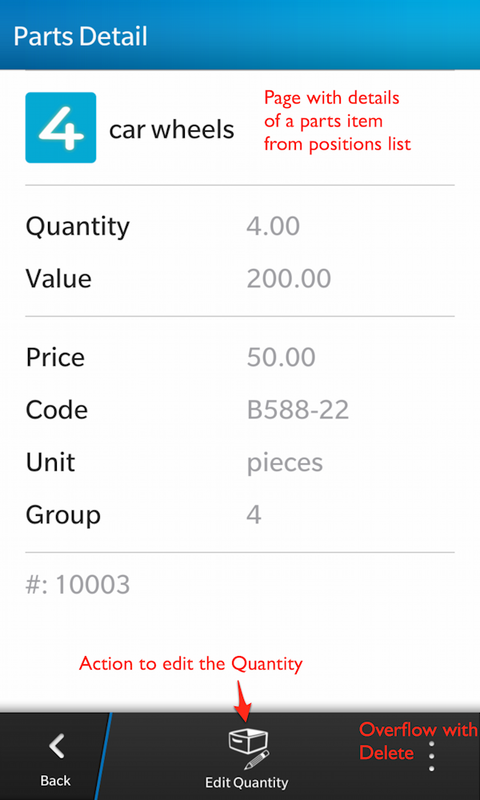 You can start with a TabbedPane to separate your app into segments. Each TabbedPane can contain single Pages or a NavigationPane as root of a stack of Pages you can push() and pop(). 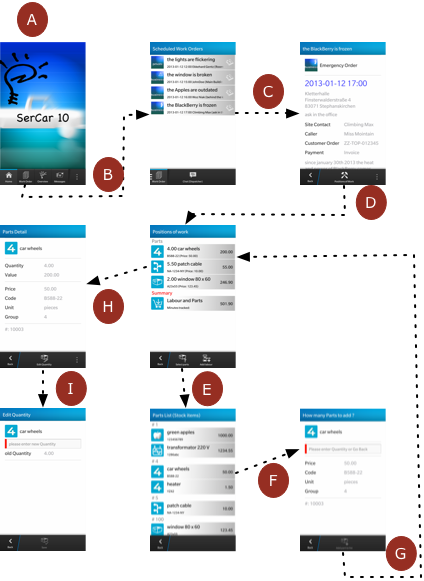 Here’s an example from SerCar10 (Management of ServiceCars with Cascades). 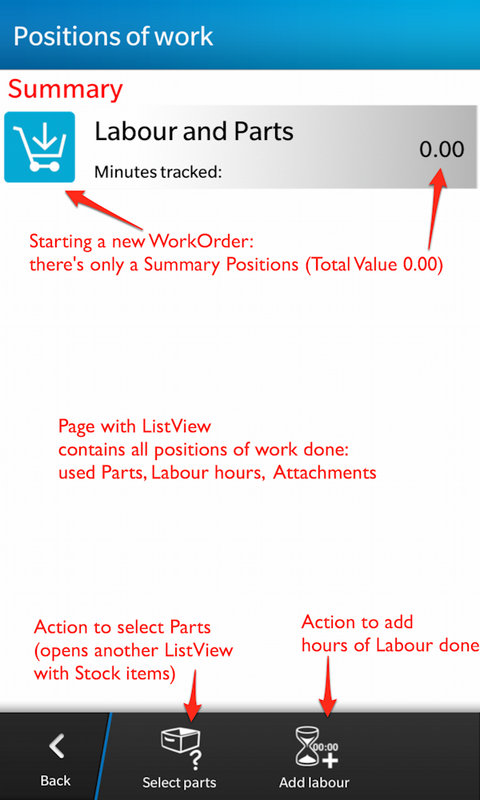 In this article we want to take a look HowTo add, edit, delete positions of work. 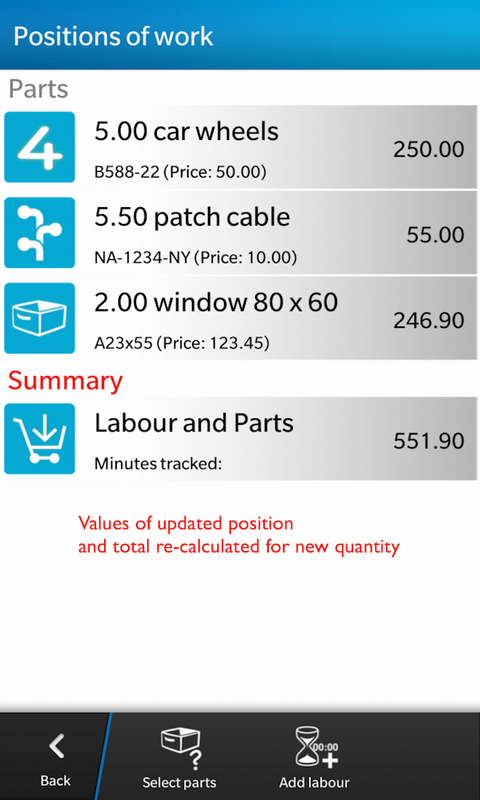 In this blog I only demonstrate dealing with positions of parts from your stock items catalogue. 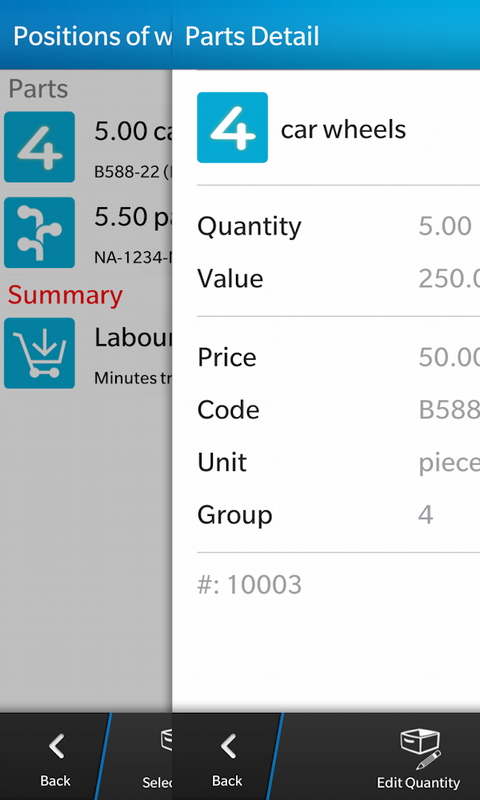 Another blog will focus HowTo add working hours. 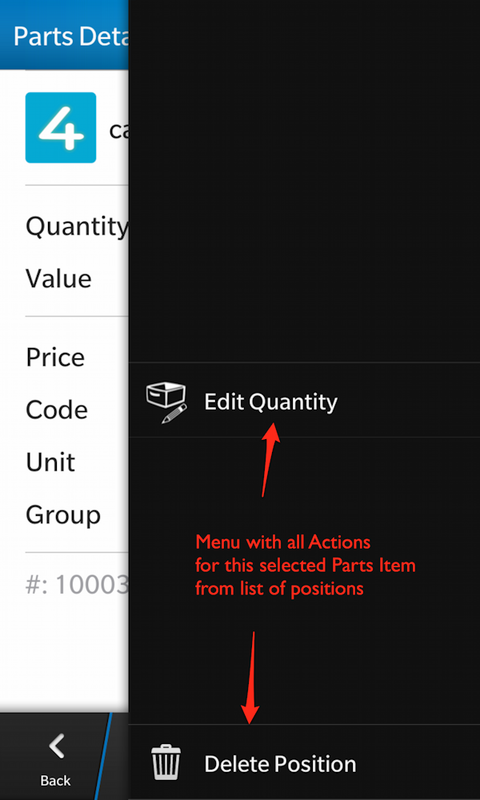 G: Action to save the selected part adds this item to the list of positions, recalculates pos value and totals and sets Working Order status in root ListView. 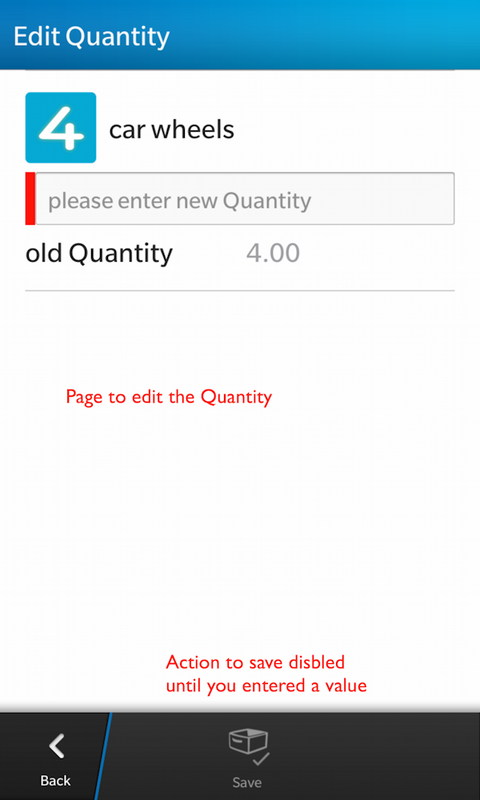 I: From this details Page you can edit the quantity or delete the position. 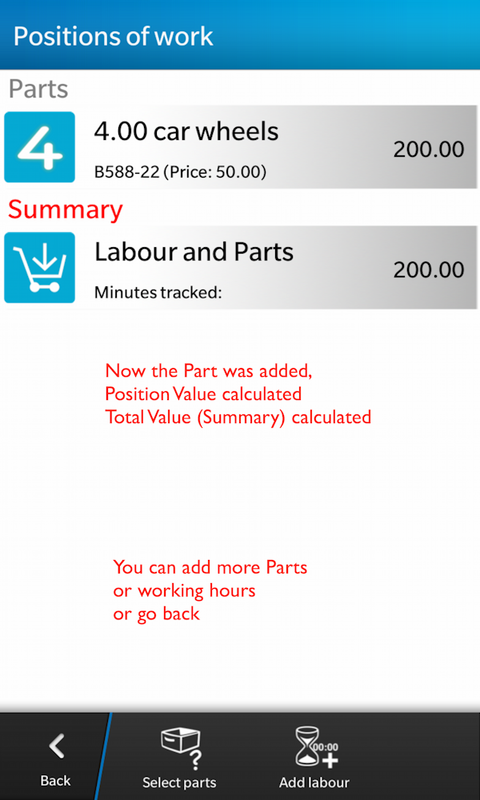 Changes are immediately visible in list of work positions. 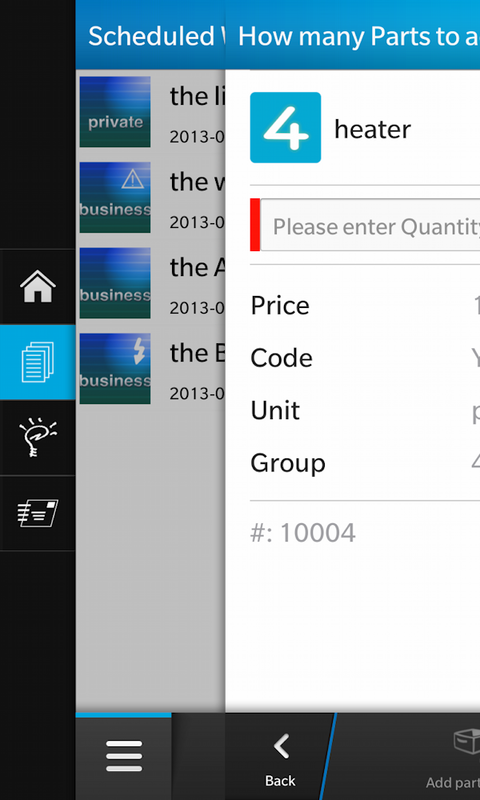 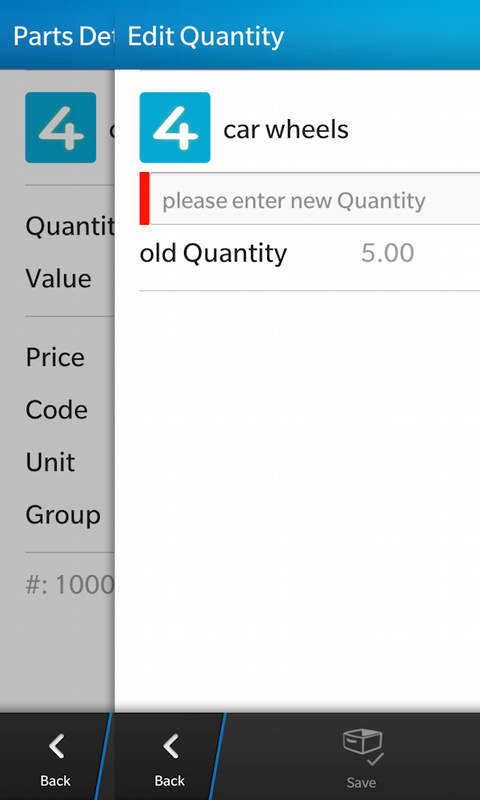 SerCar10 is a BlackBerry 10 APP for small medium sized companies to manage their service cars out there. 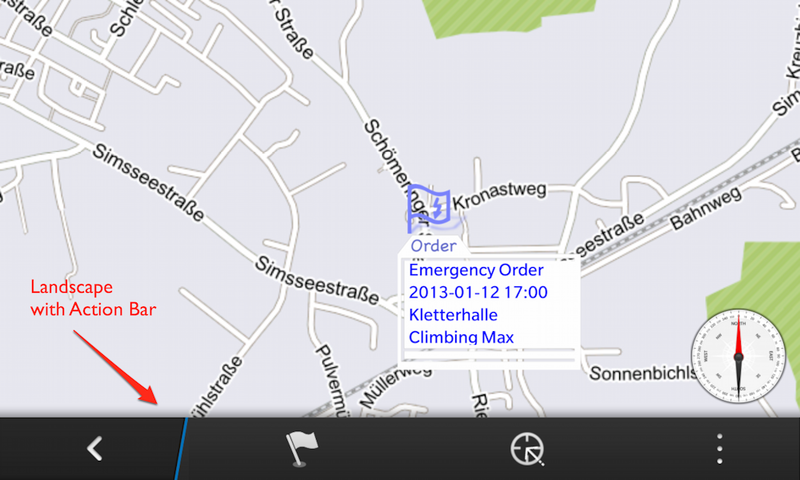 One important part are Maps and Location: Drivers of Service Cars need to know where their next Jobs are located, how to drive to the locations and what to do there. 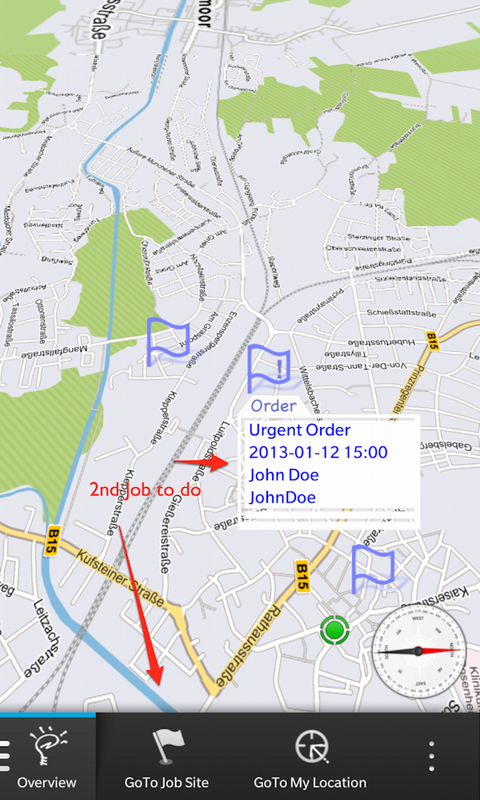 Dispatchers also need to know the locations to decide which driver goes to which location. 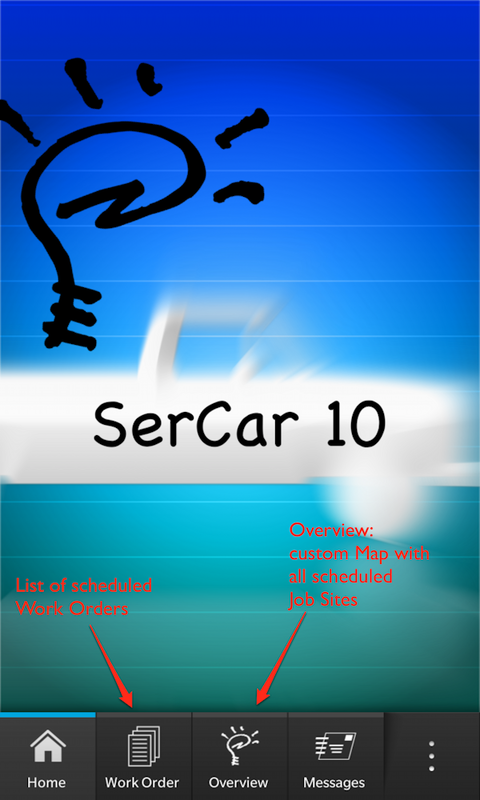 Following screenshots are from Car Drivers Module of SerCar10. 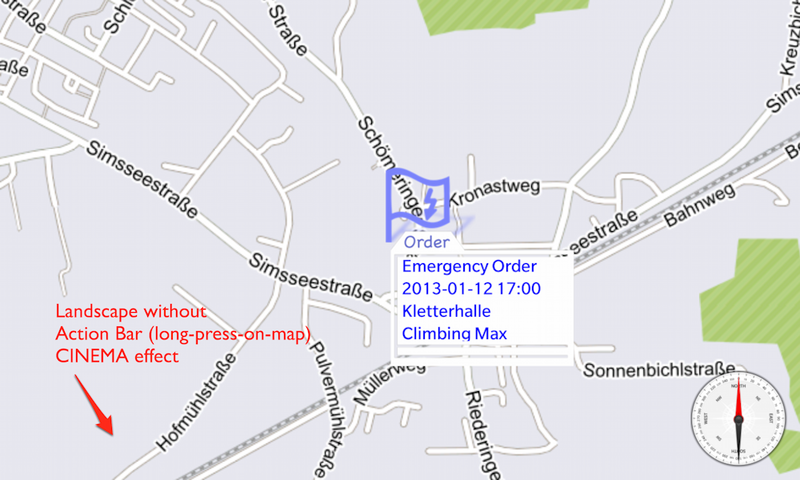 Thanks to Shadid Haque there’s a sample at GitHub demonstrating HowTo create a custom map with Cascades. Homescreen of SerCar10 shows Tabs from a TabbedPane from where you can go the most important parts of the app. 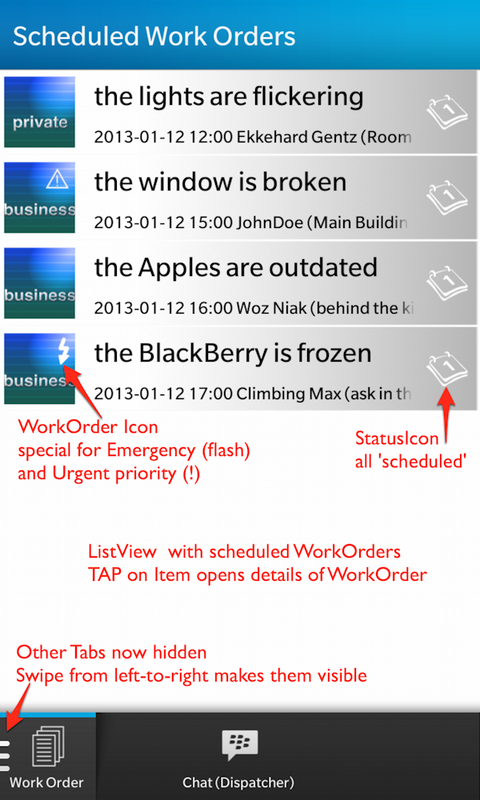 Tab on “Work Order” brings you the list of scheduled Work Orders for the day. 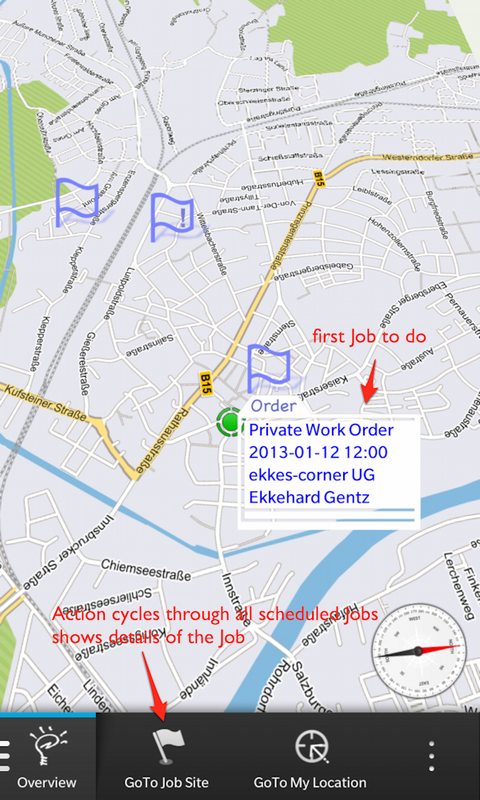 Tap on Overview shows you a Map with all scheduled Jobs. 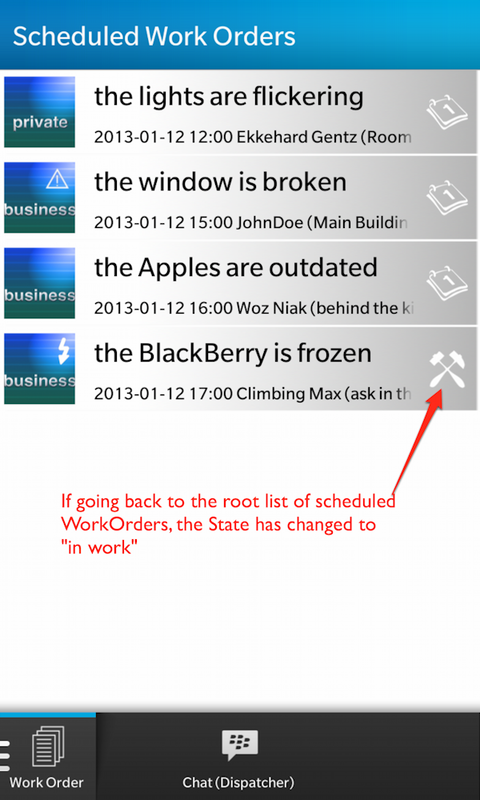 The List of scheduled Work Orders is a ListView as root Page of a NavigationPane. 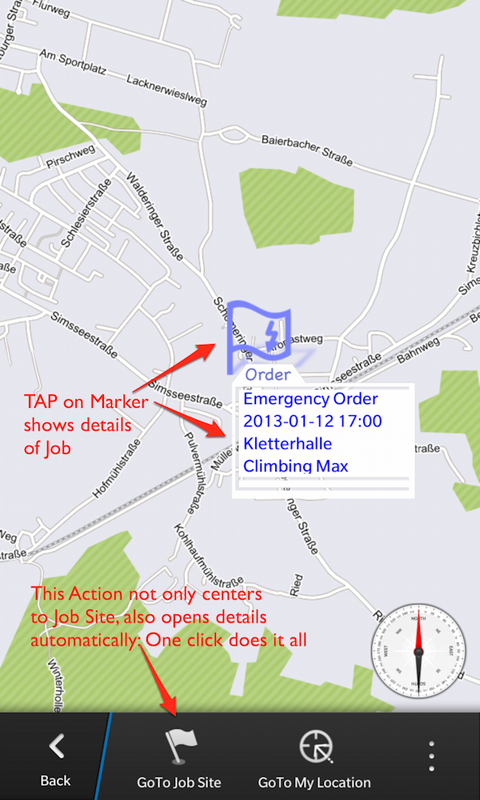 You can open a custom Map to see the location of this specific Job. 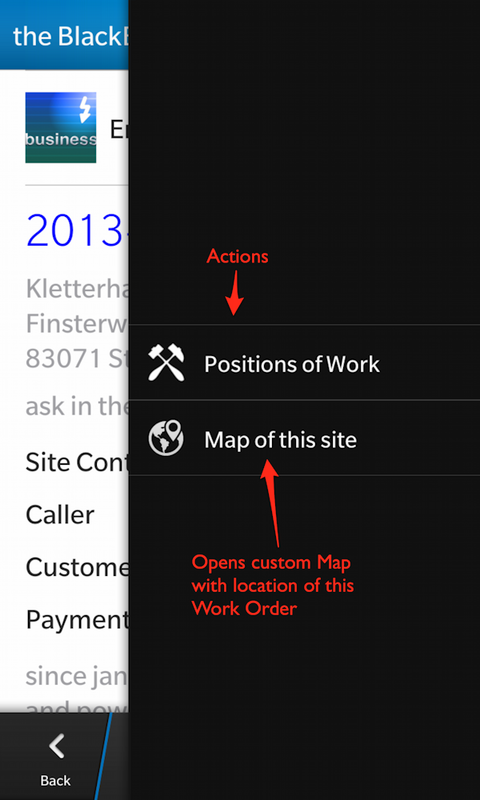 GoTo Job Site: centers the Map to the Location of this Work Order (Image Overlay – a blue flag) and automagically openes the details Overlay (short description of the work order). 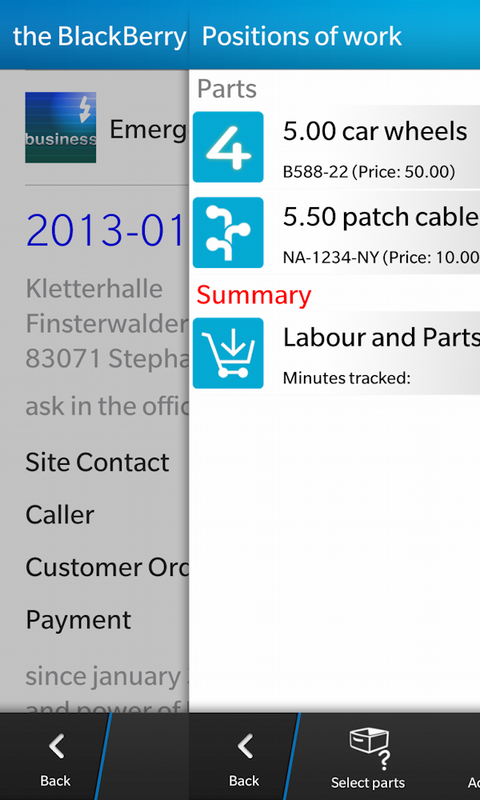 If the map is opened from “Overview” Tab you cycle through all jobs of the day: each tap jumps to the next job. 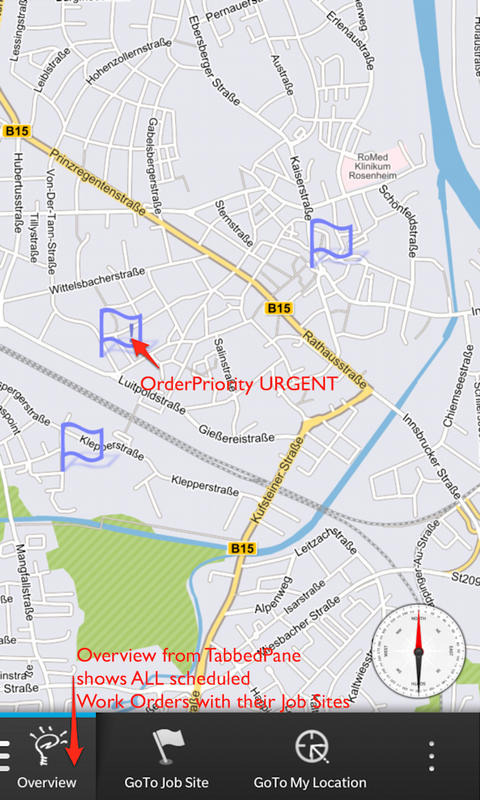 GoTo My Location: centers the map to my current location. 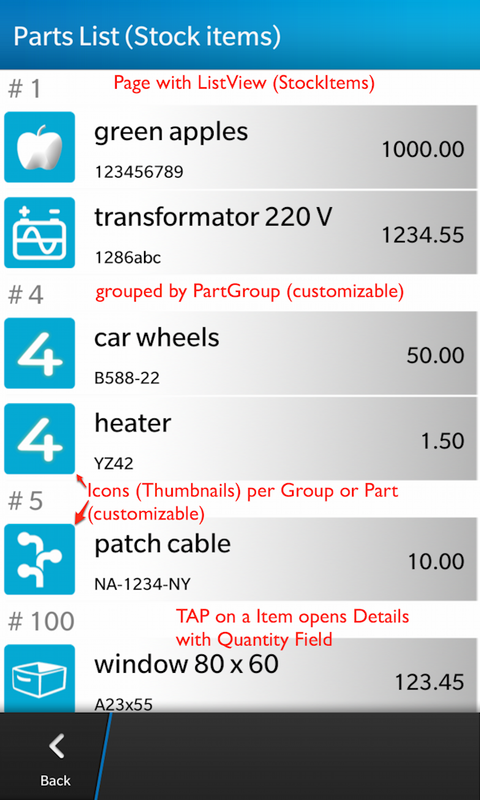 If sensors are OFF, they are switched on automatically: Compass for the heading, Rotation for tilt angle and PositionSource to get the position. 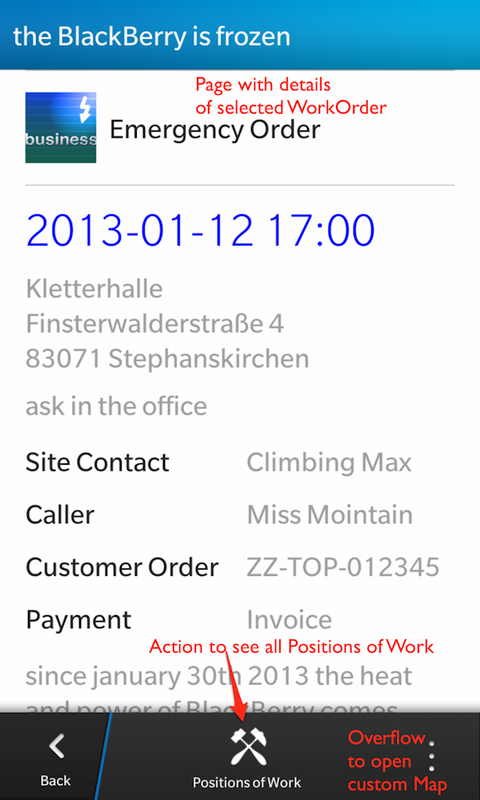 My current position is displayed as a green marker. 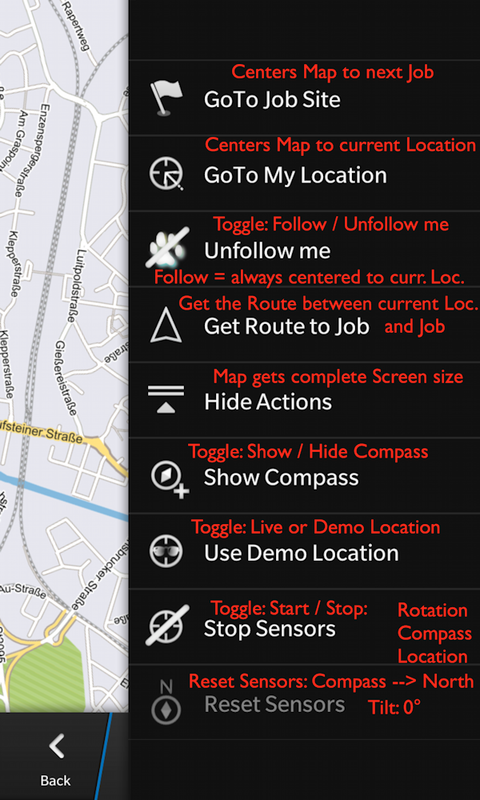 Follow Me / UnFollow Me: This is a toggle: follow me always centers the map to my current location – this is useful if you’re driving to the next job. 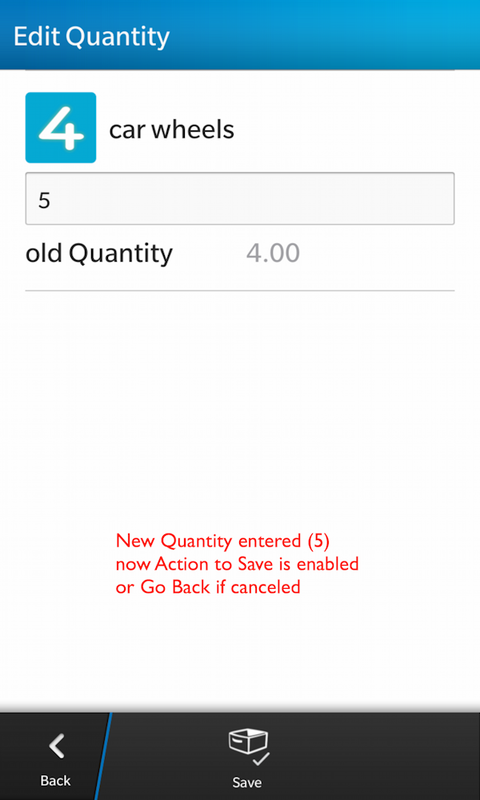 Unfollow still gets your current location, but you’re free to drag the map where you want. 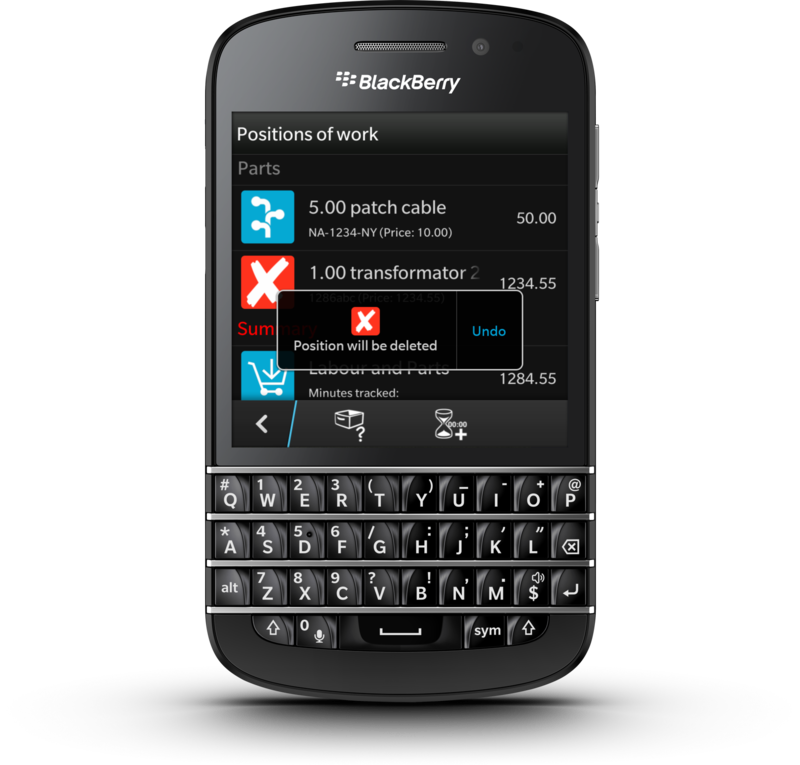 Get Route to Job: This action is only enabled if Sensors are ON and invokes the BlackBerry10 RouteMapInvoker to get the Route from your current location to the selected Job Site. 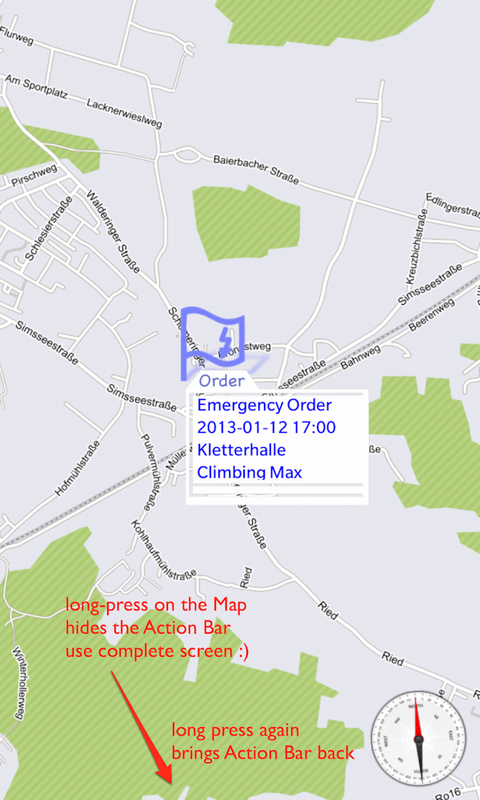 Hide Actions: This action hides the ActionBar from bottom of your screen to see as most as possible from your map. You can also do a long click to hide the Action Bar and you have to do a long click to get the Action Bar back. 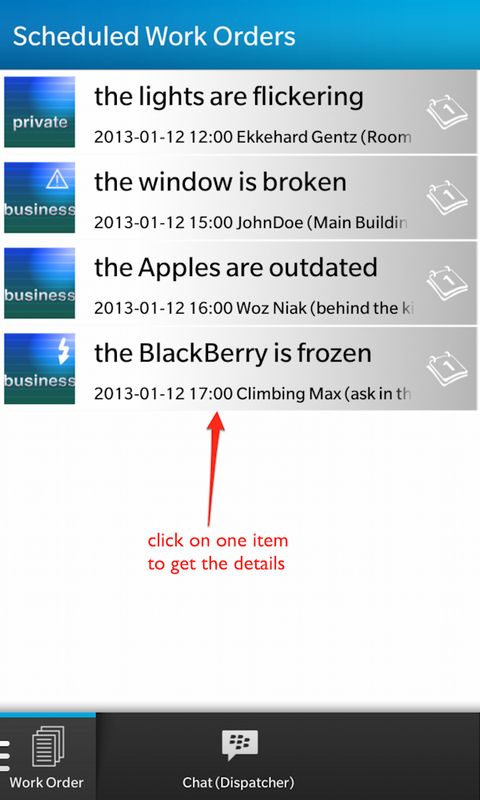 Show Compass / Hide Compass: thios Toggle Action allows you to hide the Compass to free the space. 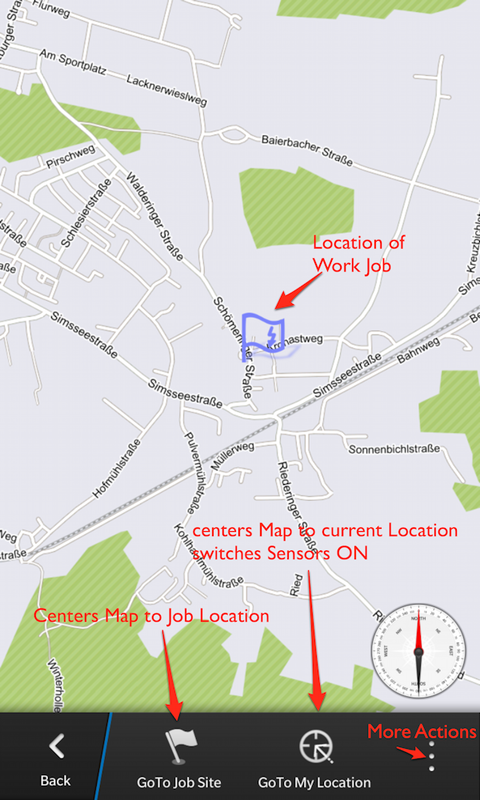 Use Demo Location / Use LIVE Location: a toggle to decide if your location should be the real one tracked from PositionSource or a fix Location (Rathaus of Rosenheim). 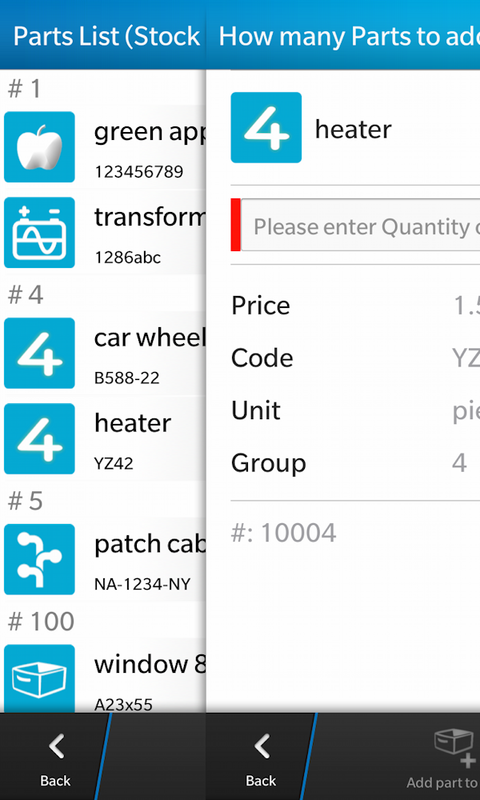 If you’re running the app in demo mode (Try-before-you-buy) it makes no sense to track your live location to simulate a Car Drivers work. 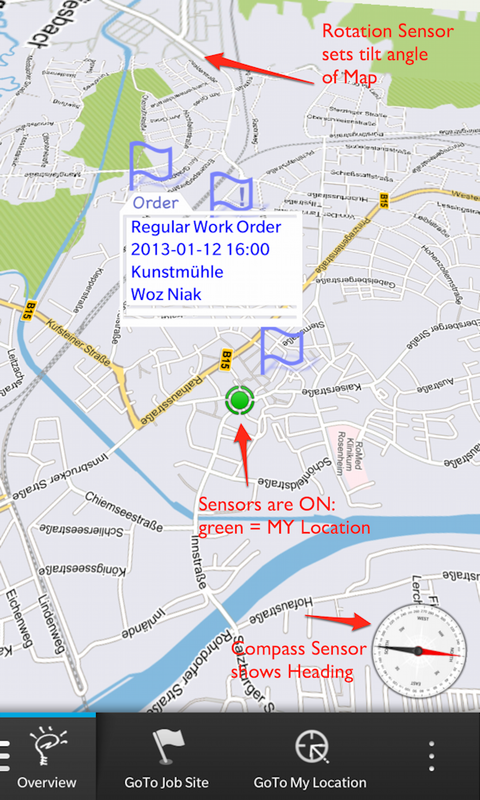 Show My Location / Stop Sensors: a toggle to start or stop the sensors. 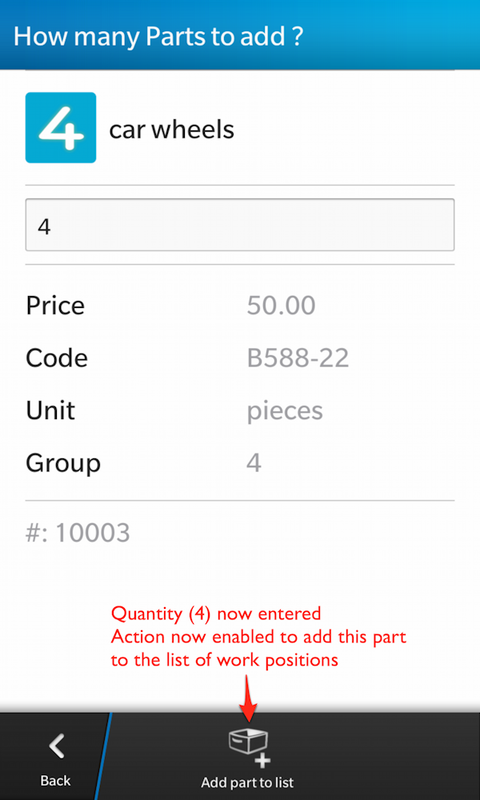 Reset Sensors: this action is only enabled if you stopped the sensors. 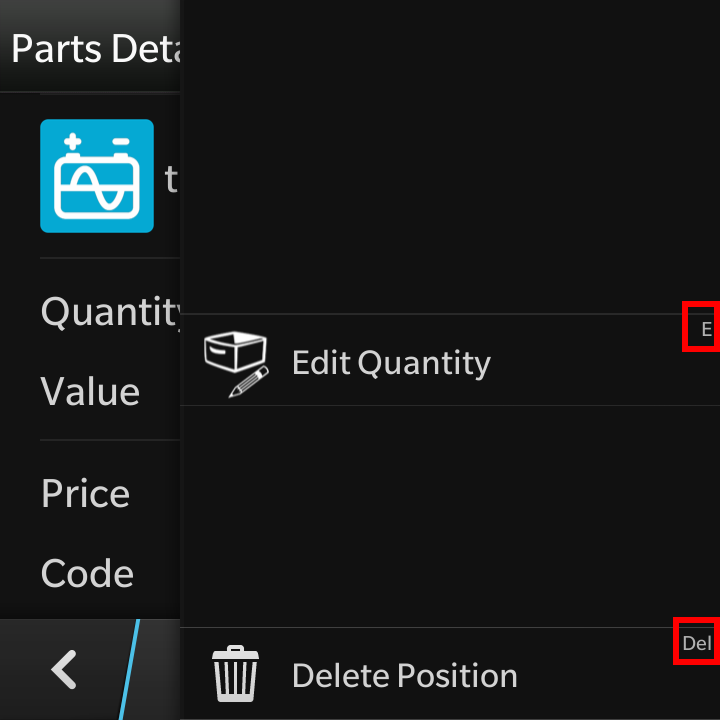 Stopping the sensors leaves the map in the heading from compass and tilt angle from rotation. 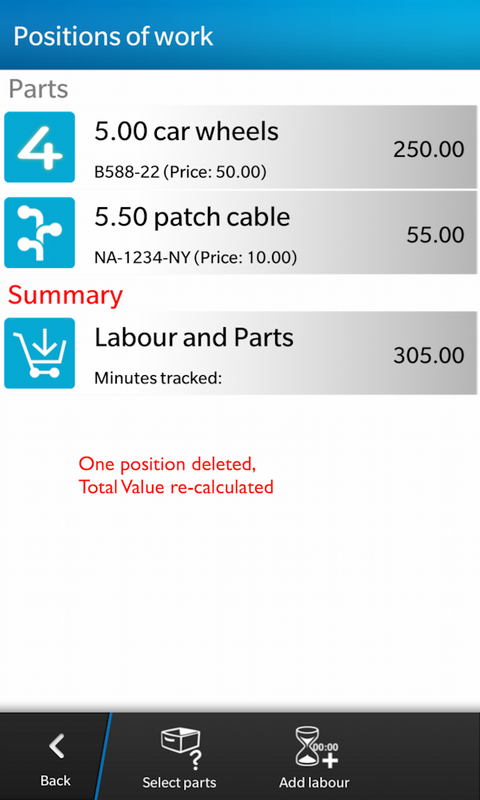 If you want to go bacjk to heading to North and tilt angle 0°, simple reset the sensors.